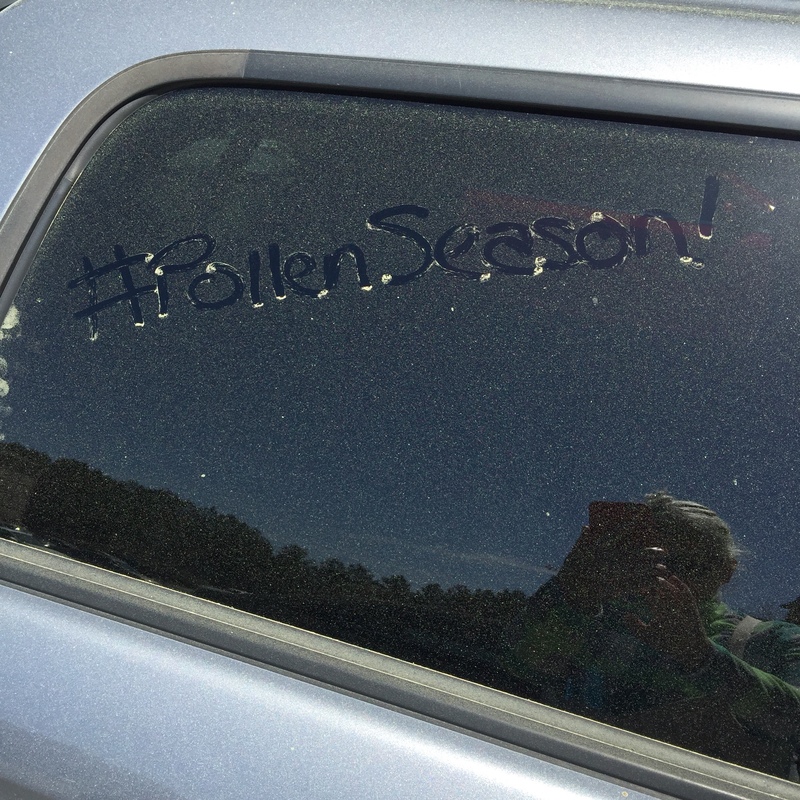 Soooooo… Pollen Season is a thing here. The stuff that turns everything yellow is pine pollen: it flies through the air like snow, though in daylight you don’t really notice it until it accumulates on a surface (usually within a few minutes). Though it looks like I should be scratching my face off, the pine pollen doesn’t seem to trigger my allergies (though every other tree pollen seems to, as does grass and weeds). And I’ve been meeting more locals. For instance, I had my fortune told by this lovely lady while I was walking along the Company Mill trail in Umstead Park. I found my way to one of the two brick-and-mortar camera stores in town and spent a couple of hours drooling over old film cameras and getting friendly with the folks in the store. Speaking of drooling, I also made a trek to Lyla Jones Bake Shop at Crabtree Valley Mall and got myself a belated birthday cupcake. No pictures though, because damn it, sometimes I just want to eat the cupcake! Circling back to the subject of seasons, I have seen more snow in the past three months than in the previous 25 years. It snowed on my birthday and we may have had a “wintry mix” over this past weekend, but snow is no longer novel for me, so I was not inclined to stay up until 2am like I was awaiting the arrival of Santa Claus. There are very few days that I have NOT worn a sweatshirt since my arrival three months ago. I know that will change soon enough (temperatures are supposed to get into the 80’s over the weekend): my hope is that we have spring and not jump from winter straight into summer. Here’s something I never had to give much thought to, living in California, Oregon, and Arizona: hurricane names are rotated every six years and the list for the year is released before the season starts. They also retire names, if the storms associated with them were particularly destructive and deadly. I’m used to earthquakes being named for the area in which it was centered (with the exception of Earthquake Ethel’s), rather than having people names. JFC. I just can’t even with you anymore, Bay Area. I had a couple of odd “I’m not in the Bay Area anymore” experiences recently. I was at a cafe, sitting at an outdoor table2 and I noticed a man with his dog at a nearby table. The guy was working on his Macbook Pro and after a while he got up to take his dog over to a grassy area for a wee. The part that astonished me was that he left his laptop AND his phone on the table AND NO ONE TOUCHED THEM. In the Bay Area, hell that Macbook and phone would have been snatched while he was sitting there and in the middle of typing AND he’d probably get punched out, just because. I had pulled the chair my camera bag and purse were parked on so close to me that the edge of the seat was about to leave a permanent indent on my shin but seeing this guy walk away from his electronics for several minutes inspired me to push the chair a whole three inches away from me! It only took a few weeks for me to be spoiled by being able to park my car in front of my apartment. After a couple of decades of street parking or parking lots, I appreciate the convenience. There have been a few times when the spaces in my lot were all full and I had to park in an adjacent lot and I found that really annoying, but not for the reason you might think. I wasn’t upset that I had to walk a little farther to get to my front door. The problem was I couldn’t see my car from my front window, and I get damn salty about that. I realize that I can count the number of times on one hand (and still have fingers left over) that I could see my car from my front window living in the Bay Area–and that my car was way more vulnerable to vandalism and burglary in Mayberry By The Bay (a.k.a. Alameda) than it is here. I’m sure I’ll let my guard down a bit at some point. As for Dos Gatos Locos, they are fully settled into life here. They love the fact that I work from home because it’s more opportunity to scream at me for treats. Mostly, though, they nap most of the day, as you do, when you’re a cat. 1Harris Teeter has these periodic buy 2 get 3 free sales on shredded cheese. THIS IS WHY I’LL NEVER BE VEGAN. 2This outdoor seating area was also the first time I had to deal with smokers in restaurants, which is surprising in that it took nearly three months for this to come up. Cigarette smoke tends to bring up a lot of old childhood emotional gunk (not to mention the gunk that ends up in my throat and lungs), so I wrapped up my lunch and journaling session sooner than I wanted to.